Please read this notice before using the (ISOLgate) web site (the “ISOLgate”). The material on this web site is made available for the purpose of providing access to causal factors of accidents/incidents related to earth mover tyres and rims operation and maintenance and providing access guidance only information such as recommendations and checklists but is not to be relied on as professional advice. The University of Queensland does not exclude or limit the application of any provision of any statute including the Trade Practises Act 1974 (Cwth) and any implied condition or warranty the exclusion of which would render this notice or part thereof to be void (Non-Excludable Provision). Subject to any Non-Excludable Provision, the University of Queensland excludes:- all conditions, warranties and terms implied by statute or general law in relation to the use of the ISOLgate ; any implied liability to the user for loss including consequential or indirect damage arising out of, or in connection with, the use of the ISOLgate ; lost profits and damage suffered as a result of claims by any third person in relation to the ISOLgate use; all liability to the user in negligence or other non-contractual cause of action in respect of which liability can be excluded for acts or omissions of the University of Queensland arising out or in connection with the delivery and use of the ISOLgate . The information in this ISOLgate web site including the ISOLgate Checklists and recommendations should not be used as a substitute for professional advice and assistance. Such advice and assistance should be obtained before you take any professional legal and or commercial decisions or steps in any matter in reliance on the ISOLgate information. The ISOLgate web site is not intended to be comprehensive or complete as to its subject matter and may not be up to date or current. The ISOLgate records contained in this web site are summaries only and which are not comprehensive, exhaustive or complete as to their subject matter. The ISOLgate web site information may use terms, which may have technical meanings that may be different from their ordinary meanings and accordingly may require specialist knowledge and expertise to understand properly and use effectively. The databases used for the ISOLgate web site may contain large quantities of information, which has been entered manually as records and errors and inaccuracies may occur in such a process although efforts are made to identify such errors and inaccuracies. It is not always possible for The University of Queensland to check the accuracy of the information provided by third parties. 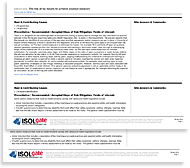 Inaccuracies may arise in that information in different ways and those inaccuracies may not be evident to the provider or users of the ISOLgate web site. The information accessible through the ISOLgate web site does not show all relevant matters in relation to the mining, minerals processing, quarrying or related industries industry. Some matters will not be recorded in the databases although our databases and web site information are under regular development and review. Information supplied for the ISOLgate user survey will remain completely anonymous. Alert Service information will be used to notify the user of new publications within the ISOLgate database. When you visit the ISOLgate our Internet Service Provider may make a record of your visit and logs the following information for statistical purposes - the user's server address, the user's top level domain name (for example .com, .gov, .au, .uk etc), the date and time of visit to the site, the pages accessed and documents downloaded, the previous site visited, and the type of browser used. This information is analysed to determine the traffic through the server as well as access levels to specific pages. In addition cookies may be used to track user login information. If/when they are created they are used for that purpose only. In order to deliver better services, The University of Queensland may also perform statistical analysis to establish priorities and allocate resources. No attempt will be made to identify users or their browsing activities except, in the unlikely event of an investigation, where a law enforcement agency may exercise a warrant to inspect the Internet Service Provider's logs. The statistics and log files may be preserved indefinitely and used at any time an in any way necessary to prevent security breaches and to ensure the integrity of the information supplied by ISOLgate.